So Liesl over at Disdressed tagged me (meaning I'm supposed to list six weird things about myself) two weeks ago, and I'm finally doing it! Peer pressure. :) Okay. Let's see. 1. This weekend I had duck tongues for dinner. In Chinatown. We have lots of fabulous Chinese friends, and they've introduced us to all kinds of delicacies over the years. Along with periodic duck tongue samplings, I've had intestines, lung, blood cakes, fish balls, and uterus?!? Thanks, guys. Did I forget anything? 2. I don't own a cell phone. Never had one. Is that weird? My coworkers think I'm Amish. [Update: It became necessary to get one. Bummer. 3. I love to peel sunburn, off myself or anyone who will let me. 4. I bought a fireplace video to play on my TV since we don't have a real fireplace. I like it a lot. I think it's funny. I like to play it for people, but they don't think it's as funny as I do. 5. I have size 11 feet. It takes a lot of courage to admit this to The General Public, because I've been ashamed of it my whole life. Or at least since my feet have been 11s. I'm hoping this public declaration will somehow free me from the secret shame of walking into shoe stores, working up my courage to ask if they have anything in an 11, and seeing the clerk's eyes widen and immediately drop to my feet, followed by a stuttered, "Um, n-no. Sorry." Or else they manage to pull out one pair of grandma shoes from the back. Thankfully people's feet must be getting bigger, since it's getting slightly easier to find them. But they're still never as cute as the NORMAL shoes. 6. For the past month, I've had Weird Al Yankovic's song parody, "Trapped in the Drive Thru," stuck in my head, thanks to some friends. You know who you are. You have read this article random with the title January 2007. You can bookmark this page URL http://jenkrebs.blogspot.com/2007/01/six-weird-things.html. Thanks! ...I hope! 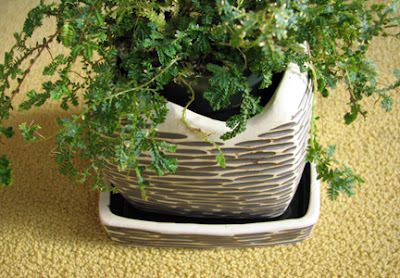 I love this plant, a gift from Jim and Jill, and this pot that Alex gave me for Christmas from Sprout Home. I hope I don't kill it. The plant, I mean, not the pot. Pretty sure the pot is safe. You have read this article favorite things with the title January 2007. You can bookmark this page URL http://jenkrebs.blogspot.com/2007/01/stayin-alive.html. Thanks! The Christmas stuff is stashed away, and it was looking bleak around here. Spring seems soooo far away. 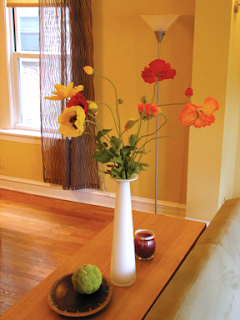 Had to haul the summer poppies out of storage to make myself feel better. I think it's working. Next project: happy curtains for the kitchen. You have read this article decorating with the title January 2007. You can bookmark this page URL http://jenkrebs.blogspot.com/2007/01/sick-of-winter.html. Thanks! 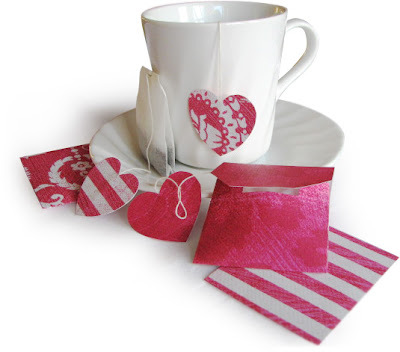 Here's an idea to dress up your Valentine tea party or mail to a tea-drinking friend. Carefully take apart a paper tea bag wrapper. Trace around the edges on some pretty paper. 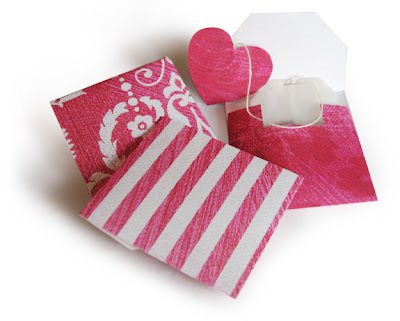 (You may need to add a fold-in glue tab to each side of the front of the envelope; most tea bag wrappers are sealed without tabs.) Glue or double-stick tape it together. Pull the tag off the end of the string. Sandwich the string between two cut-out heart shapes and glue together. Tuck the tea bag back into its new envelope and seal with a sticker, tape, or glue. You have read this article paper / tutorials / valentine's day with the title January 2007. You can bookmark this page URL http://jenkrebs.blogspot.com/2007/01/tea-time.html. Thanks! You have read this article with the title January 2007. You can bookmark this page URL http://jenkrebs.blogspot.com/2007/01/that-one-went-by-wayside.html. Thanks! I felt like changing things a little. Do you like the new header up there more or less than the old one? Hmm. I'm not satisfied. Will make another one. You have read this article with the title January 2007. You can bookmark this page URL http://jenkrebs.blogspot.com/2007/01/i-got-bored.html. Thanks! 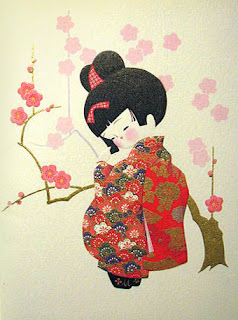 Yesterday this lovely card arrived from my friend Valerie, who found it in Japan. It's embossed and has gold metalic ink. Thanks, Val! Your letter made my day. No. My month. You have read this article with the title January 2007. You can bookmark this page URL http://jenkrebs.blogspot.com/2007/01/delightful-mail.html. Thanks! You have read this article cards / paper with the title January 2007. 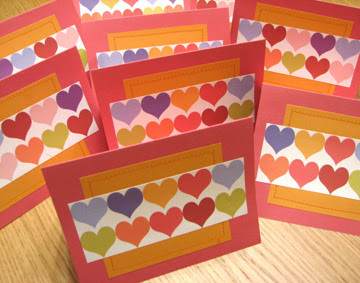 You can bookmark this page URL http://jenkrebs.blogspot.com/2007/01/i-heart-hearts.html. Thanks! These sites might be helpful for folks in need of digital art. The New York Public Library Digital Gallery contains a wealth of historical art and illustration. Most images are public domain, but the Library does charge a usage fee to license an image for commercial use. A great source of inspiration for patterns and antique designs. iStockphoto, recently purchased by Getty Images, is an inexpensive source of royalty free stock photography and illustration. Prices range from $1-$15 (as opposed to $400 for a royalty-free image on Getty's site). Let's hope they stay this cheap. I haven't used these before, but they're worth looking into: Fotolia, Big Stock Photo, and StockXPert. You have read this article resources with the title January 2007. You can bookmark this page URL http://jenkrebs.blogspot.com/2007/01/photo-and-illustration-sources.html. Thanks! 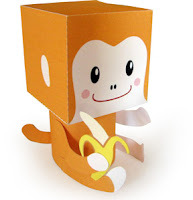 So I found a template on Flickr via Papercraft World for some paper animals, and had to try it. Here's my orange monkey. He looks cute in the photo, but in reality, his head won't stay on. (I was too lazy to dig out the good glue. Easily fixed.) And I couldn't figure out what some little dashed lines on the template were for. But he makes me smile. Try one. Get the template here. You have read this article downloads / paper / tutorials with the title January 2007. You can bookmark this page URL http://jenkrebs.blogspot.com/2007/01/odd-little-square-head-monkey.html. Thanks! You have read this article tutorials with the title January 2007. You can bookmark this page URL http://jenkrebs.blogspot.com/2007/01/more-tutorials-from-around-web.html. Thanks! I'm giving this one to some people I like. I think it will look right at home in their house. But yikes! Does anyone else get scared when giving your art as gifts? What if they hate it, and keep it in a closet, only to whisk it out and guiltily hang it up just before I come over every time? Or what if they get sick of it on their wall, but feel obligated to keep it forever? I'll make sure to tell them to dispose of it whenever they don't want it anymore. You have read this article paintings with the title January 2007. 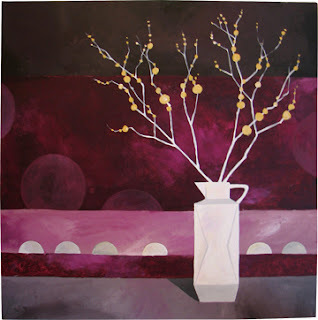 You can bookmark this page URL http://jenkrebs.blogspot.com/2007/01/purple-painting.html. Thanks! You have read this article with the title January 2007. 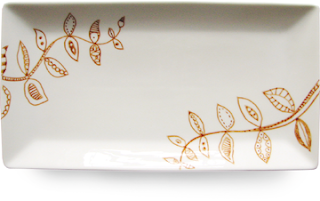 You can bookmark this page URL http://jenkrebs.blogspot.com/2007/01/drawing-on-ceramic.html. Thanks! You have read this article decorating / fabric with the title January 2007. 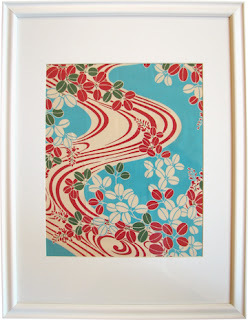 You can bookmark this page URL http://jenkrebs.blogspot.com/2007/01/more-framed-fabric.html. Thanks! We spent last week in Arizona with friends. Our visit included a trip to The Shady Dell in Bisbee, an old copper mining town near the Mexican border. 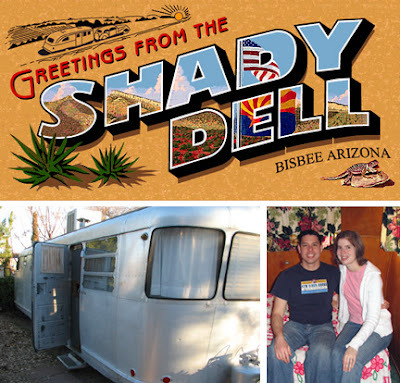 At The Shady Dell, guests stay in 1950's aluminum campers, each decked out with different vintage fabrics, appliances, and games. We LOVED it! We got a kick out of making Spirograph art, playing records, percolating some coffee, and watching Creature From the Black Lagoon. 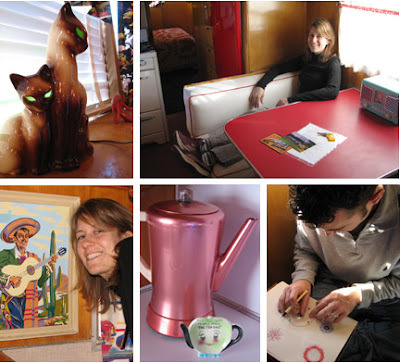 (Also check out the pix of the paint-by-number art and the siamese cat lamp with eerie glowing eyes.) Next time you're near Bisbee, you have to stay at the Dell! You have read this article travel with the title January 2007. You can bookmark this page URL http://jenkrebs.blogspot.com/2007/01/retro-fun.html. Thanks! You have read this article baby / fabric / tutorials with the title January 2007. You can bookmark this page URL http://jenkrebs.blogspot.com/2007/01/baby-stuff-to-make.html. Thanks! These will be a gift for my brother and sister-in-law, who are having a baby any second. 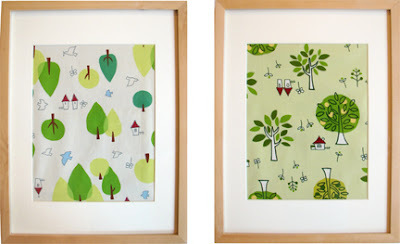 The fun stick-figure houses and stylized tree fabric came from Megumi. She found it somewhere in Tokyo in a dollar bin, and it's so cute I decided to frame it. You have read this article baby / decorating / fabric with the title January 2007. You can bookmark this page URL http://jenkrebs.blogspot.com/2007/01/nursery-decor.html. Thanks!